Most of our articles about lead acid batteries refer to large (20Ah+) batteries connected into a battery bank. Such battery banks are typically used for large scale solar charging – for example, to power the lighting in a home. We have also looked in detail at the solar charging of NiMH AA cells for very small scale solar projects – for example, to recharge an iPod, torch, or radio. There is a middleground of projects for which a 12V battery is required to be charged by a solar panel, but for which the battery need only be relatively small – i.e. 1Ah to 20Ah in size. Unlike AA cells and large sized batteries, these can be quite hard to find and can also be overpriced. Therefore in this article we will look at what is available. For reliability and easy maintenance, a sealed deep cycle lead acid battery should be selected. Non deep cycle batteries are completely unsuitable for solar applications since they are not made to be discharged deeply – something which will happen from time to time during periods of cloudy weather. Choosing a sealed battery reduces battery maintenance to zero, since nothing is ever going to leak out, and there is never any need for watering. Prices start from £3.85 (bulk purchase of 1.3Ah exc. VAT) to £16.95 (purchase of one 14Ah exc. VAT). NEW If you require larger batteries ranging from 20Ah up to 100Ah, click here: large 12V deep cycle batteries, or click here to read our article Deep Cycle Batteries for Sale. A plug in mains charger for a 12 Volt battery is a very useful item to have. When you purchase a battery, it needs to be fully charged before it is first used. Also, there may be times when solar power alone is insufficient to get the battery up to full charge. 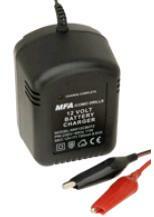 Pictured above is an excellent basic automatic 12V Lead Acid Charger from Rapid. This charger is fitted with insulated crocodile leads for easy connection to small 12V batteries, and has in-line fuse protection. It provides an output current of 720mA (8.6 Watts output) – sufficient to safely charge most small batteries over night. When the battery reaches full charge, the charger turns off automatically and a red charge complete LED lights up. This product is available for around £10 and is an excellent partner for the 12V batteries listed above.